When designing the VTNG Routing Valve, Prillwitz & Co has introduced a new concept in pneumatic conveying line diversion. The transfer of material flows is done through a spinning rotor that can forward the product in any of two ways, depending upon the desired direction of the flow. Pressure does not affect the work of the lock, and it is possible to achieve perfect seal even under high pressure. 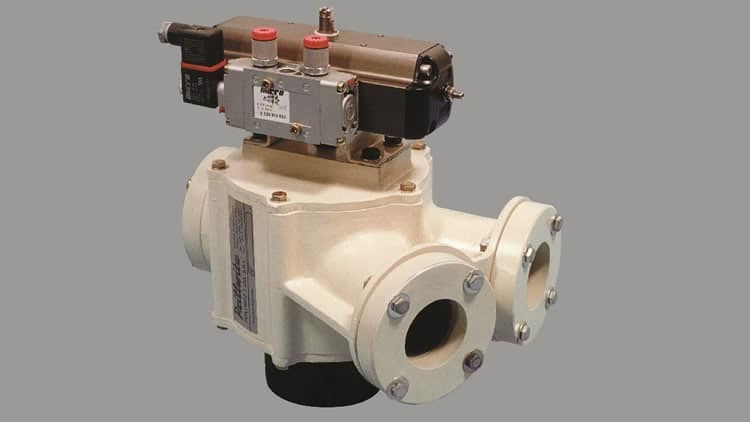 Unlike older systems, our routing valves have the added advantage of components´ greater life because they are not made of mechanical parts that erode. The body and rotor are made of cast aluminium. The shafts and the couplings are made of steel and bronze, respectively. However, all parts can be manufactured out of a wide variety of materials, depending upon the particular needs of the user. The rotary diverters can be supplied with a mannual control, or with a rotating actuator and an electrical valve. Micro-switch detectors to establish position of grains is optional.